Quadrant Engineering Plastic Products (EPP), the leading global manufacturer of high-performance thermoplastic materials, visits the 2017 Global Petroleum Show (GPS) in June to showcase innovative materials for static and dynamic high-temperature and high-pressure (HTHP) applications. In its 49th year, the GPS is a leading industry event, attracting over 50,000 energy professionals from more than 90 countries to strengthen relationships, network, and do business during this pivotal time in the oil & gas sectors. The GPS focuses on global aspects of these industries, including cutting-edge technologies that improve process efficiencies. 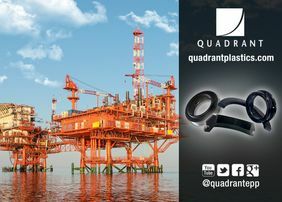 With locations in over 20 counties, Quadrant is the global leader in engineering plastics used in HTHP oil and gas applications, including seals, bushings, bearings, and other rotational wear components. Finished part solutions and stock shapes available from Quadrant help global clients find the right material for their specific applications. Quadrant’s polymer labyrinth seals, for example, have been specially designed for the turbo compressor market. The seals have 15+ years of proven performance, reducing or maintaining original tolerance over their lifetime and providing improved compressor efficiency. Testing has shown that Quadrant’s Duratron® seals virtually eliminate the tooth deformation and mating shaft damage that is common with metal and alloy seals. Quadrant materials comply with many industry specifications—including NORSOK, ISO, ACME, API, and NACE—delivering reliability, safety, and efficiency. In addition to industry-wide specifications, Quadrant is committed to the accuracy of thermoplastics data for more successful specification writing. Our in-house lab machine-tests samples from post-process stock shapes to ensure our customers receive materials that are on-spec and comply with ASTM/ISO standards. In the oil & gas sectors, specifying the right material is critical. Part failure can be particularly disastrous, with leaks leading to environmental damage, lost revenue due to downtime, and even death. With a focus on research and development, Quadrant continues to meet or exceed end-user demands for performance and efficiency gains with engineered polymers in the form of semi-finished products and finished parts. Inspired by the challenges faced by design engineers, Quadrant continuously works to develop new materials and improved processes. Innovation is seen not only as a key driver for growth within the company, but also a core competency—allowing Quadrant to form collaborative partnerships with clients and customers. Visit Quadrant EPP at the 2017 Global Petroleum Show (booth #1803) at Stampede Park in Calgary, California from June 13-15, 2017. Application specialists and technical experts will be on-site to answer questions.